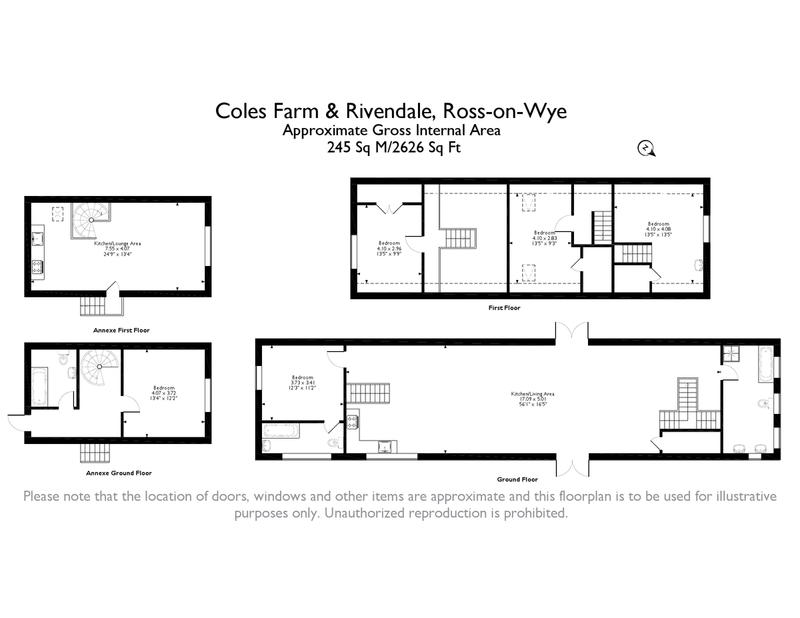 	Coles Farm is accessed off a quiet country lane and is set in the idyllic rural location of Foy which is a popular hamlet nestled on the fringes of the market town of Ross-on-Wye. The nearby village of Bridstow has a primary school with bus route to Ross-on-Wye and Hereford. 	There is excellent schooling; primary school at Bridstow and John Kyrle Senior School in Ross-on-Wye. 	Coles Barn has been beautifully converted to provide spacious and stylish open plan accommodation. This property benefits from four bedrooms and two bathrooms and has a light and airy feel with picture windows taking in the countryside views. 	Rivendell, originally the Granary, has now been converted to provide a character home with open plan kitchen/ living area with picture window over the surrounding countryside and one bedroom and bathroom. 	Both properties are accessed via a central driveway flanked by lawns to either side which leads to the gravel driveway providing parking for numerous vehicles. 	There is a five bay open fronted barn sited to the rear of the main barn. 	Coles Barn: The garden is low maintenance and is bounded by picket fencing with path leading onto flagstone patio with flat lawn areas to either side great for 'Al fresco' dining and entertaining whilst taking in the countryside views. Oil Fired Central Heating, Double Glazing, Under Floor Heating to Ground Floors to the Main Barn. Both the barn and granary are currently tenanted on an assured short hold agreements, notice can be served to arrange vacant possession on completion. From Ross on Wye take the 3rd exit from Wilton roundabout to Hereford (A49) and then take an immediate right turn passing Bridstow School. Follow the country road passing Bridstow church on the right hand side and continue along this lane for approximately 2 miles and at the end the road forks left and right, take the right hand fork signposted Foy and continue along this lane until you come to the church on the right hand side. The gravelled drive to Coles Farm & Rivendell is clearly marked on the left hand side immediately past the church car park. *Agents Note: According to the owner there are three fishery beats on the Wye in Foy which may be available to book. Two are currently managed via the Wye & Usk Foundation, namely The Creel and Foy Bridge Fishery and the other by Backney Fishery.